So instead of Kimchi, I decided to use the rest and make something a tad different, a nice little refresher with radishes and b b b b beeeeeeets! but once ya get all the bad odds and ends off, look at these beauties! Dazzling chioggia and golden beets! Add a little salt (I did 2 teaspoons for this kraut) with that bowl of radishes pictured above, three beets, and about 10-15 head of bok choy. Massage massage massage until ya have some brine going then pack it into a jar/crock and let the magic happen! Remember to keep checking up on your kraut every day or two! Stay tuned for how this is pretty-n-pink kraut! Ferments made it back to the farm today! Just after three days these guys are already really going! Bubbling and fermenting away! With that said, the only next best step was to make Kimchi, two different recipes! So this is my first ever attempt at making kimchi, so I really just kind of made up the measurements off the top of my head. I chose to not use fish sauce for the purpose of I don't have it and I want to be able to share these ferments with everyone. Just blend everything together, put the spread on your kimchi and massage, massage, massage your veggies!! Once ya get a nice brine going, Take all your veggies and stick em in a jar. Remember to check on your ferment everyday or so and push it down to keep all the veggies in the brine! 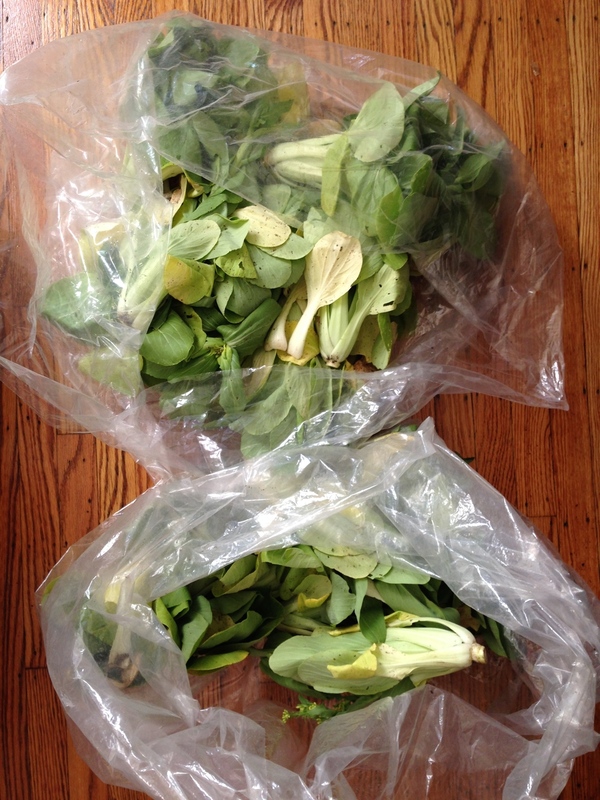 Here's a lil photo of the Whole Leaf Bok Choy Kimchi after two days! Then I just like to cover the ferment up before jarring it, to allow it to get a little go before I jar it up! A little aside from pickling, but just as important, another place I hold very near and dear to my heart is Two Boots Farm in Hampstead, MD. Two Boots Farm is run by Elisa Lane and her husband Doron and it's so wonderful out there! Elisa has been such a huge inspiration to me and is one of the hardest working people I know. Having started Whitelock Farm and moving on to starting her own farm out in Baltimore County, Elisa is doing some wonderful work and when I went to go visit the farm today, everything was looking absolutely beautiful! An awesome photo of Elisa and her husband Doron that I stole off their website. Check it out: http://www.twobootsfarm.com ! Cucumbers, squash, kale, etc. all basking in the sun! So the best part of this trip was when Elisa told me that there are wild raspberry bushes surrounding her farm. They were wild black raspberries!! Hands smothered (and mouth) is raspberry juice from one of the most joyful harvests I've had thus far this season. It didn't end there! Then Elisa took me to the black currant bushes! Used my raspberry stained fingers to pick the last of these awesome black currants. You want know what time of the season it is? You want to know what's going to happen in a week or two? Your fridge is going to become overwhelmed with zucchini and squash to the point where you can't roast or grill it anymore. Slathering hummus on it won't help either. One of our first zucchini squash was a big doozy, so I decided to snag it, harvest some of the squash blossoms, and take some split turnips to turn things up a little. Still keeping it pretty subtle, pretty simple. "Quick" in the title doesn't mean quick as in "this is going to pickle in a day". "Quick" means it takes about 1 minute to chop this all up, another minute to arrange everything in a jar, and one last final minute to pour some salt water on it. A big excuse people have to pickling is that they just don't have the time. Ok, sure. BUT you could take three minutes out of your extremely packed day to save that zucchini before it goes bad in your fridge and give your micro biome some good lovin' in a few weeks. So chop up your zucchini and any other vegetable you want to add to your pickle in any desirable size (mandoline slice if you want your slices really thin) and just stack it all in a jar! One big zucchini filled up two quart jars for me! So pickling things is not a huge dent in your wallet, really there's barely a dent that's made. You can find glass or ceramic jars anywhere for a buck or two (peruse around some good thrift stores! ), you have your veggies already, so last but not least you need your salt. Not totally necessary, but why not just up the ante and invest in some good mineral sea salt?? Make that pickle the best pickle it could be! So for these pickles, I just made a quick salt water brine, which really is what it sounds like. Salt and water mixed together and poured on your veggies. For these pickles, I did 1 teaspoon of sea salt that I dissolved in enough water to fill one jar. And that's it! Now just make sure that the brine level reaches the last veggie in your jar, so everything is pickling and submerged in the brine. The final thing to do is check up on your pickles every day or two, give it a little push in the brine, and in a week or two you should have some zucchini pickles! You can also just store away the jars in a nice cool place to slow down the pickling process (or store it in your fridge) once your zucchini has reached a pickled stage to your liking (the longer it's out in a warmer area fermenting, the stronger the ferment will get). This pickle also gives you a nice chance to break away from that zucchini, turn down your oven and grill, and give yourself some time to miss it. Pop open a jar in a month or two once you're ready to zucchini it again. Flowered mustard greens, garlic by the stalk-ful, herb garden kicking in, time for a good 'ol cabbage kraut with a twist! Mustard flower, garlic, and oregano kraut! Last but not least! Top of your kraut with some beautiful mustard flowers! Once you have all the goods together in a nice big bowl (or any sort of container that can hold all this produce plus give you room to massage your kraut without making too big of a mess) add your salt and now the fun begins! Keep massaging all the veggies together until the vegetables naturally start to let out water which is the beginning sign of your brine! No need to add water, no need to add vinegar! With a little salt, a little time, a little love your vegetables will be on their way to becoming a beautiful kraut! *garlic and oregano can be adjusted to your liking! A little more, a little less, whatever floats your boat! **when making kraut, taste the kraut after each addition of salt! If you taste it and it's not salty enough, add a little salt. Too salty? You probably over-salted it.... Don't be afraid of over-salting your kraut, start off with a tablespoon, massage your kraut, taste it. If you feel like it needs a little more, add a little more! If you're fine with the amount of salt and your kraut is well into the brining process after a little loving massage, you're all good to go! Once your veggies have released a fair amount of liquid and all your vegetables are starting to seem almost as if they're "sogging" up, time to pack your kraut into a vessel, crock, jar you name it! With these last important jarring tips you'll be on your way to kraut in no time! -WEIGHTS, weighing your kraut is super important! You want all your vegetables to be submerged into the brine that your kraut has naturally produced thus far (and will continue to do so!) Specific crocks for kraut may already come with weights, but if not, finding a plate or something flat to use to push down your kraut and you put something heavier on top of that always works to keep everything submerged. Also, filling ziplock type bags with water or any sort of heavy object has been my best bet! Any vegetables not submerged in the brine will mold. Try and check on your kraut everyday if possible to see how everything is going and changing, and to most importantly give it a little push on top to keep all those veggies in that brine! Now, the length of time you choose to ferment your kraut is up to you. I like my kraut pretty fermented, so I go on for about 3-5 weeks. If you're just joining the fermenting game, I would wait a week and try your kraut. If it's at a point that's good for you, jar it up, store in a cool place or your fridge (colder temperatures slow down fermentation), and enjoy! Radishes split, turnips don't look so great, scallions get a bad harvest... kraut! Just because your veggies turn out like this doesn't mean they should go to waste. 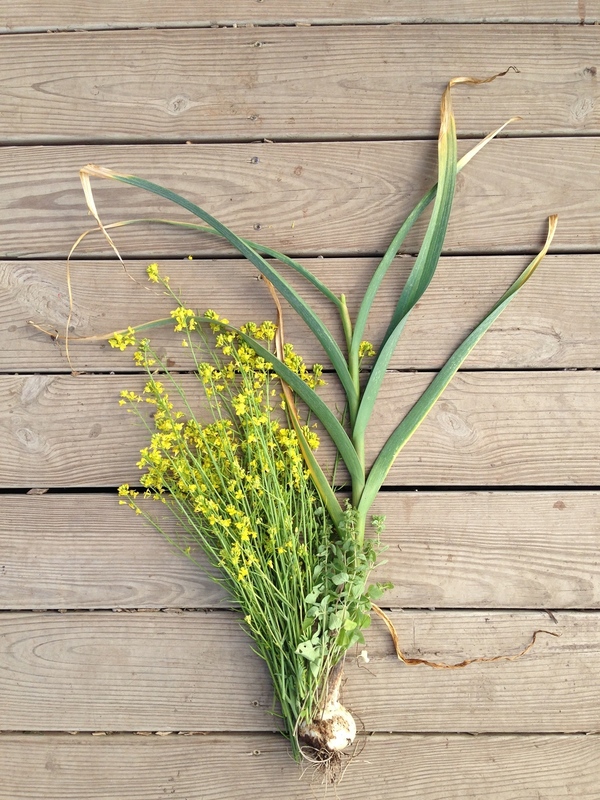 Fresh spring garlic for kicks! Stay tuned for the results next week!